Ballinamore Family Festival starts this weekend! One of the most anticipated festivals in the North West, Ballinamore Family Festival returns to town for it's 52nd year this Sunday, august 12 - it runs until August 19. Like every year, the town puts on a unique festival that is made up of free events for seven days, exactly what we all need as the Summer holidays draw to a close. The festival opens on Sunday, August 12 with local playwright Seamus O'Rourke and President of the Leitrim Association of New York Dessie McWeeney cutting the ribbon. The new Lord or Lady Mayor will be crowned on stage. Ruailie Buaile Band will perform at 3.30pm, with Johnny Brady singing into the night from 9pm on the platform. Monday, August 13 is jam packed with canoeing and water skills, mural painting, swimming competition, family fun and GAA skills competition! Ninja Warriors Ballinamore Style take to Main Street at 7.30pm before the Festival Fleadh & Cultural Night on the platform. Tuesday is Agricultural Show Day. At 6.30pm the Boxty Eating Competition returns before Twisted Ninjas entertain for the night from the platform. Wednesday, August 15 is a mixed bag starting with a tour of the fire station for kids at 2pm, and a bonny baby competition at 4pm. The fun continues with the Over 40s Mens Football in Sean O'Heslin GAA Park at 7.30pm. The very popular Top Shelf will play the free concert while for €10 experience hypnotist Jason O'Callaghan in Freddies from 10pm. Thursday, August 16 you can draw with Dawn, improve your soccer skills and watch the final of the Ninja Warriors, before Robert Mizzell takes to the town platform at 9pm. Friday, August 17 will cater for tiny tots discos and senior citizen party and everything inbetween! Ballinamore Athletics Club will hold their 10k and 5k race from 7.30pm and Binocular Soccer & Dodge Ball make a welcome return on Main Street. Don't miss the FREE open air concert by Class Éireann. Saturday, August 18 kicks off with the Children's Fancy Dress at 1.30pm, before the Sean O'Heslin's GAA Blitz at 4pm, the Hunt and Duck Final at 7pm. The John Joe McGirl Commemoration Parade starts at 8pm and Bagatelle with support band The Wave hit the Platform at 9pm. The festival draws to a close on Sunday, August 19 with a FREE Family Fun Day on Main Street with kids obstacles, slides and more. At 7pm watch out for Team skiing on Main Street. 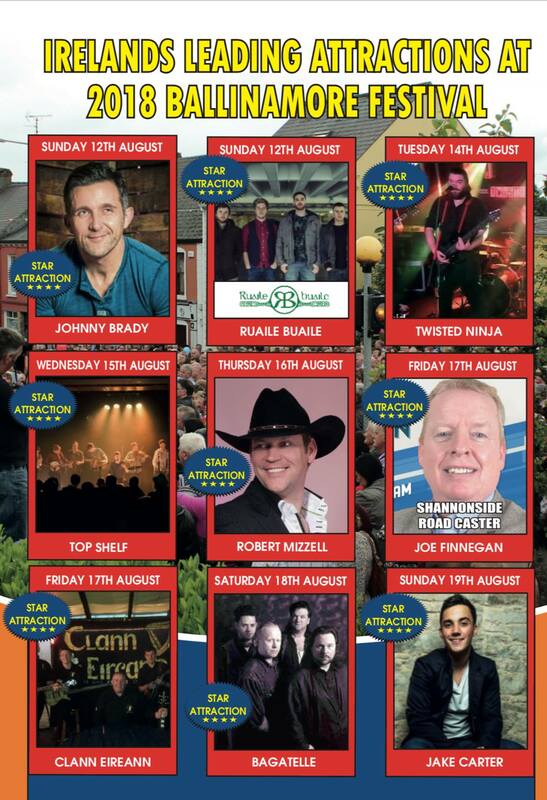 Jake Carter is the main act on Sunday night, he will perform on the platform at 9pm. Brother of Nathan, the 19-year-old already has a large fan base and will be hoping to convert a few more listeners into fans after his apperance in Ballinamore!